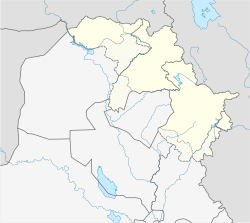 Sulaymaniyah (Kurdish: سلێمانی‎ Silêmanî; Arabic: السليمانية‎, as-Sulaymāniyyah), also called Slemani,, is a city in Iraqi Kurdistan. Sulaymaniyah is surrounded by the Azmer Range, Goyija Range and the Qaiwan Range in the northeast, Baranan Mountain in the south and the Tasluja Hills in the west. The city has a semi-arid climate with very hot, dry summers and cool, wet winters. Sulaymaniyah served as the capital of the historic Kurdish principality of Baban from 1784 to 1850. From its foundation Sulaymaniyah has been a center of great poets, writers, historians, politicians, scholars and singers, such as Nalî, Mahwi, and Piramerd. ↑ Ali, Meer Ako. "Sulaimany: 227 years of glory". kurdistantribune.com. Retrieved 2 January 2014. ↑ Salih Rasha, Akram. Sulaymaniyah 200 Years. Sulaymaniyah, Kurdistan. pp. 503–504. This page was last changed on 10 December 2018, at 12:23.